On Comex the PRICE OF GOLD closed up $16.40 (1.32%) at $1,238.70. In the aftermarket, though, it dropped about $9.00 to $1,229.60. Why? No clear reason. Chart on the right, y’all will see the bullish flag or pennant I mentioned yesterday. 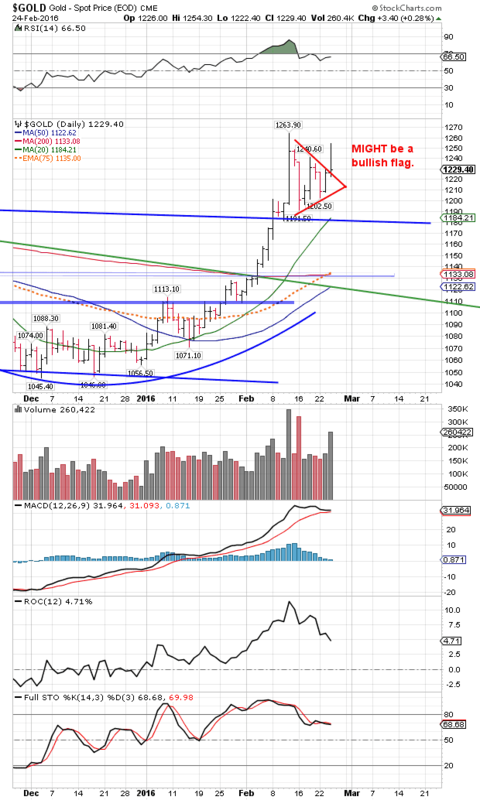 Today the PRICE OF GOLD broke strongly UP out of that pennant. Great — break to a new high for the move, except that later it dropped clean back, giving up much of the day’s gains. After a rise into new ground, that leaves me sore as a rented mule. ‘Tain’t right. Add to that the GOLD/SILVER RATIO at a new high, 81.003. Think of that as a giant cast iron lid coming down on a dutch oven, pressing that chicken (gold price) down into that pot. It also stands right at the top channel boundary line. This situation shall not last long. Chart on the left. One other thing: today’s high leaves that pennant looking more like a “bearish flag” than a pennant, and as its name whispers, a bearish flag usually resolves downward. No question SILVER PRICE did begin a key reversal on an End of Day chart, even though it rose 5.7¢ (0.4%) on Comex to $15.292. Rose into new high ground only to close lower. On strongly higher volume, so it’s likely to persist that direction. Unless the gold price can close above $1,264, it faces another leg down and soon. 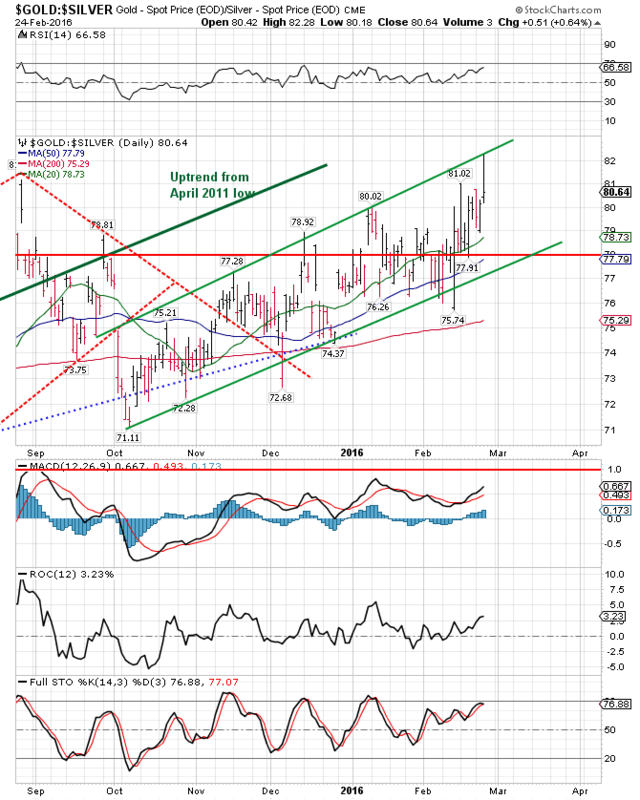 Silver’s acting like a sea anchor, pulling the gold price back. Don’t let any drops, even large ones, scare you off. That’s your opportunity to load the boat! I appeared on a new show today, David Simpson’s True Money. It was a lively and enjoyable 45 minutes. You can listen to it at http://bit.ly/21h6f4x and it should be available today. If not, ’twill be tomorrow. Look for True Money Episode XI. I didn’t know anything about the Veritas Radio Network, but now I’m intrigued by the little bit I do know. All’s Right In The World. Sure. Wells Fargo bank set aside $1.2bn for potential losses on oil and gas loans today. On 17 February JPMorgan set aside $500mn for its potential croppers. JPMorgan Chase is the largest (by total assets) bank in the US. Wells Fargo is the fourth largest. Mama, trouble in the oil patch means double trouble in the bank patch. Dollar index pushed higher, but remains mired in the mud at 97.50, where today it closed. Don’t like 97.50 a-tall. Euro lost 0.08 to $1.1010, going nowhere slow. Yen hit a new high for the move at 89.25, up 0.4%. Whoa! Another day of improvement for Susan’s eye. Most hearty thanks for all your prayers.